Visit Kowloon Walled City Park, a serene Chinese garden that was once a lawless criminal enclave. 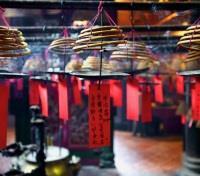 Explore Wong Tai Sin, a temple sacred to Taoists, Buddhists, and Confucianists alike. 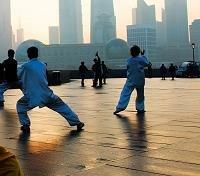 Take part in a relaxing Tai Chi session along Hong Kong’s beautiful waterfront. Shop for jade, silk, and rare antiques on Cat Street, Hong Kong’s bustling curio district. Stay in a luxury hotel handpicked by our travel experts. A bustling nexus where East and West meet, Hong Kong is a fascinating place to discover. This brief adventure makes the most of limited time, introducing travelers to the city’s gardens, tea houses, and antique shops with the expertise that only a private guide can provide. Start your time in Hong Kong with a little serenity. In the company of a private guide, head out to Kowloon Walled City Park, a vast classical Southern Chinese garden built on the site of a 19th-century fort that, once abandoned, became Hong Kong’s most notorious criminal enclave. 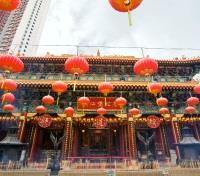 From the park, you’ll move on to Wong Tai Sin, Hong Kong’s most famous Taoist temple. (Buddhist and Confucian worshippers frequent the site, too.) Before returning to your hotel, visit the Chi Lin Nunnery – a grand Tang dynasty monastery built from hand-carved yellow cedar and assembled without a single nail. 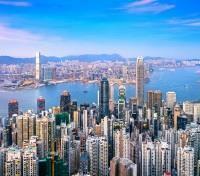 As a dynamic meeting point for East and West, Hong Kong can be a little overwhelming. Take things a little slower with a morning tai chi session along the Tsim Sha Tsui waterfront with great views of Victoria Harbor and Hong Kong Island. Later, take part in one of China’s most important cultural rituals with a private tea service at a local tea house before experiencing a restorative reflexology session with a skilled expert. Please note that with this tour you will have a private guide, but rather than traveling by private vehicle, you will make use of Hong Kong's efficient local transit system. Right at the heart of Hong Kong’s prime shopping district of Tsimshatsui, The Langham, Hong Kong is surrounded by delectable dining, shopping and entertainment options. Legendary Victoria Harbour, one of the most photographed harbours in the world, is also just a two-minute walk from the hotel. Personalised service is always in style. World-class cuisine. The Langham, Hong Kong hotel is unlike any other. The stylishly appointed rooms and suites feature every modern convenience and an undeniable timeless elegance. The Langham offer Three Michelin-starred cuisine and inspired dishes along with picturesque views of Kowloon. Experience the art of dining in Hong Kong. Enjoy a relaxing sensory experience in the heart of Hong Kong. The state-of-the-art Fitness Centre and rooftop swimming pool will help you stay healthy, while the tranquil day spa offers a collection of pampering treatments to help you unwind. Hong Kong is a kaleidoscope of life, a sophisticated fusion of East and West; a city of diversity where new and old meet at every turn. Today you will discover how traditional Eastern values live in harmony with the fast-paced Western influences in metropolitan Hong Kong. Start the day with a slow motion tai chi class. During the hour-long lesson along the Tsim Sha Tsui waterfront, enjoy fantastic views across Victoria Harbour to Hong Kong Island. Continue on to a tea house where you will learn about tea and the intricate rituals involved in drinking it. A Chinese tea cup may look small, but it holds a great deal more than tea and water. As you listen to the tea expert, you might believe you are sipping the distillation of thousands of years of Chinese culture. The final stop is to enjoy a foot reflexology session, which involves applying focused pressure to certain known reflex points located in the foot that correspond to certain other areas in the body so as to cure or prevent disease. It is based on the premises that our nerve zones or reflex points go from the bottom of our feet to the top of our head, encompassing all vital organs on the way. 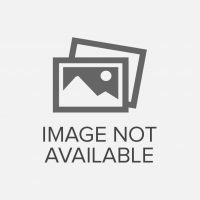 Most of Hong Kong Island’s antique shops are bunched along Wyndham Street and Hollywood Road in Central and Sheung Wan and if your home is missing that final finishing touch, how about a piece of rare Ming dynasty furniture, an ancient snuff bottle or a Cultural Revolution propaganda poster? Upper Lascar Row, known as Cat Street, is where you can find such treasures, within its fantastic congregation of antique dealers, curio merchants and art galleries. This is also the place to go for bargains in jade, silk products, embroideries and wooden handicraft items. Next visit Lian Yi Museum. The four-storey museum is home to one of the world's largest and best-curated collections of Chinese antique furniture, made of the treasured materials huanghuali and zitan, from the Ming and Qing dynasties. Like Hong Kong itself, Liang Yi Museum is a blend of East and West. For those interested in Chinese antiques, the furniture will enthrall. However, for those curious about European history, the Liang Yi Museum also houses the world's premier collection of bejeweled clutches, compacts and powder boxes. Mega dealer Larry Gagosian has created a brand in its own right with 12 galleries dotted strategically around the globe. Brand-savvy Hongkongers were excited to welcome Gagosian, the largest gallery in the historical Pedder Building. You will have the opportunity to experience some of this vibrant and growing arts and antique scene up close and personal. This is a predominately a walking tour. All galleries and art spaces are located within walking distance from each other.